This article examines the reasons management of the New England groundfishery has failed, while management of the Maine lobster industry has succeeded. After 35 years of management, groundfish stock sizes and catches are lower than ever while lobster stocks are at record high levels. We argue that the New England groundfishing industry is caught in a prisoner's dilemma from which it has failed to escape. That dilemma is due to the interaction of social, political and economic variables that have lowered the benefits of investing in rules to conserve fish stocks. The lobster industry, once marked by a piracy ethic, has been able to escape from its dilemma and, over time, develop a strong conservation ethic and institutions. Our evolutionary game theory model indicates that three sets of factors are involved in this cultural transformation of the lobster industry, which has led to support for better conservation rules and for law enforcement. Efforts to manage marine fisheries have not been notably successful. An estimated 86.9% of the world’s marine fisheries are overexploited or fully exploited (FAO 2012) even though many have been under scientific management for decades. In the Gulf of Maine, one finds both success and failure. The Gulf of Maine groundfishing industry,a once one of the most prolific in the world, is now a shadow of its former self. The Maine lobster industry, by contrast, is currently experiencing record high lobster catches. Since both these industries have been under scientific management for decades, we are not only witnessing different levels of economic success, but differential success of the management regimes. In this article, we compare the Gulf of Maine groundfishing industry and its management with that of the lobster industry to discover why one management system has succeeded whereas the other has failed. We argue that the essential difference is that the lobster fishery over the course of decades has been able to evolve a strong conservation ethic (a subculture) that motivates fishermen to support and enforce conservation rules; the groundfishery has not. Rational choice theory argues that people choose norms or rules to gain the benefits of coordinated activities and joint action. Simply because norms should produce favorable results, however, there is no guarantee they will be developed. The essential problem is that there is a divergence between what is rational for individuals and what is optimal for the group (Taylor 1990: 223), a situation termed a “collective-action dilemma”. In collective-action dilemmas, rational action by individuals brings disaster for larger social units (Elster 1989). Open-access fisheries present a collective-action dilemma. Since there are no property rights, no one has any incentive to protect the fish stocks. Under these conditions, it is rational for each fisherman to take all the fish he or she can as quickly as possible. Even though a rule constraining fishing effort would result in a healthier breeding stock, increased catches, lower prices for consumers, and a sustainable fishery, it is in the short-run interests of fishermen to overfish. In all too many cases including the Gulf of Maine groundfishery, fishermen do exactly that. Many collective-action dilemmas can be modeled as prisoner’s dilemma games. These are games in which both players have a dominant strategy to defect. But the payoffs for both are worse than if they had played their dominated strategy to cooperate (Dixit and Skeath 2004). From this perspective, the primary difference between these two fishing industries is that the groundfishery has not been able to solve its prisoner’s dilemma. The result is that groundfishermen get low payoffs even though they have acted rationally. Lobster management has been able to overcome this obstacle. Theoretically, the most popular way out of a prisoner’s dilemma is to let the players play the game repeatedly forever (Axelrod 1984; Gardner 2003; Le and Boyd 2007). In this case, if they are sufficiently patient, then there exists a Nash equilibrium supporting high-quality conservation rules. A way that often works experimentally is to let the subjects communicate with each other; they talk their way out of the dilemma. Another solution is to generate rules making it costly to play the dominant strategy. This is the solution that has been tried in these fisheries. It has worked in the case of the lobster fishery and resulted in effective rules; it has not worked in the case of the groundfishery. The question is why. To answer this question we have constructed a model based on the idea of adaptive behavior. Adaptive behavior describes a situation in which groups of people try different solutions to solve the problems they face. When the solutions do not work, they alter their strategies, learn from their mistakes, and gradually evolve rules that do work. This set of concepts runs through the work of Axelrod (1984, 1986) who says, “This approach is based on the principle that what works well for a player is more likely to be used again while what turns out poorly is more likely to be discarded” (Axelrod 1986: 1097). A vast literature in game theory has studied adaptive dynamics of behavior (Axelrod 1984, 1986; Hofbauer and Sigmund 2003; Le and Boyd 2007; Samuelson 2002) using the framework of evolutionary games, and we have used this approach in framing our model to explain the differential generation of rules in the lobster and groundfish industries. Data for this article were collected over the past 30 years during a number of different studies by the senior author and colleagues. We used qualitative research techniques, including direct observation of fishing; and open-ended interviews with officials, scientists, and fishermen. We have also made good use of archival materials, especially articles from Commercial Fisheries News. Studies done at three different times provided much of the data on the groundfishing industry used in this article. In 1978, the senior author and his collaborators interviewed 318 captains or owners of groundfish boats in New England to gather information useful for implementation of the U.S. extended jurisdiction (200-mile limit). We focused on obtaining general demographic information (age, education, work history, fishing experience); commitment to fishing; and attitudes towards management, the federal government, science, and support for various types of rules. In 1978, many people were ordering new boats and gear. Thus we emphasized gear switching and vessel changes. We were able interview 60% (184) of the Maine and New Hampshire captains. We conducted another study of the groundfishery in the summer of 2008 to document the industry’s decline. This study focused on gathering information on the fishing history of people who had been in the industry in the 1970s, and how they had reacted to the drastic changes in management from 1976 to 2012. We contacted by phone people who had licenses in 1970, 1975, or 1978, gathered general demographic information, and asked questions about changes in their fishing and the reasons for those changes and their attitudes about groundfish management. We emphasized gathering data on entry/exit decisions. We contacted a total of 102 of the approximately 614 names on the license lists. Only seven were still groundfishing. The others had left groundfishing for variety of reasons. Many had died or retired (see Acheson 2011). In 2008, the senior author also interviewed 21 key informants who were presently involved or had been involved in groundfish management. They included 10 fishermen, three academics, two agency directors, three employees of the Maine Department of Marine Resources (DMR), and three who had worked for the federal government. Twelve had been or were presently members of the New England Fishery Management Council. Additional information was obtained from the archives of newspapers that reported on the politics of fishery management. All of the data on the history of groundfish management rules were obtained at this time. Data on the lobster industry came from four different research projects by the senior author. Two of these studies were conducted relatively recently and provide a good deal of information used in this article. As part of a larger study on co-management, I conducted a survey in 1997 to explore experiences and attitudes of lobster fishermen about the Zone Management Law, which was being implemented at that time. I was interested in documenting fishermen’s attitudes about zone management organization, trap limits, limited entry, and other facets of the recently passed law. I also wanted information about fishermen’s attitudes toward laws passed earlier and their ideas about lobster management in general. In this study, questionnaires were sent by mail to 3,600 lobster license holders in Maine, selected randomly; 1,140 responded to this survey (see Acheson 2013). In 2009–10 we designed a study to elicit information on the development of the conservation ethic in the lobster fishery. We made good use of historical and archival records, especially the “Correspondence of the Commissioner” in the Maine State Archives and Commercial Fisheries News. We also sent questionnaires to 3,000 license holders selected at random from the license list; 701 responded. In the spring of 2010, the senior author conducted follow-up telephone interviews with 124 people who responded to the 2009 survey and had agreed to being contacted. We asked about their attitudes toward various laws, and how their attitudes had changed over time. In 2009 the senior author also interviewed 32 key informants. Twenty-one were old fishermen who were asked about the events of the 1920s and 1930s; the other 11 were officials and others involved in lobster management. The 2009 lobster survey was administered by staff of the Margaret Chase Smith Policy Center at the University of Maine. These data were then analyzed by the senior author using SPSS. (See Acheson and Gardner  for a more complete description of the results of these studies). The success of lobster management and failure of groundfish management is reflected in their historic catch figures. Groundfishing was the New World’s earliest industry. In New England, catches reached their peak about 1860 (O’Leary 1996). Since that time, catches have varied, but the general trend has been downward (Ackerman 1941). Now, the entire Gulf of Maine only produces 6% of the fish that were produced in Blue Hill Bay of Maine in the 1860s (Alexander et al. 2009). When federal management began in 1976, groundfish stocks were already at a low level. As seen in Figure 1, the downward spiral of groundfish stocks and catches has continued throughout the period of federal management. 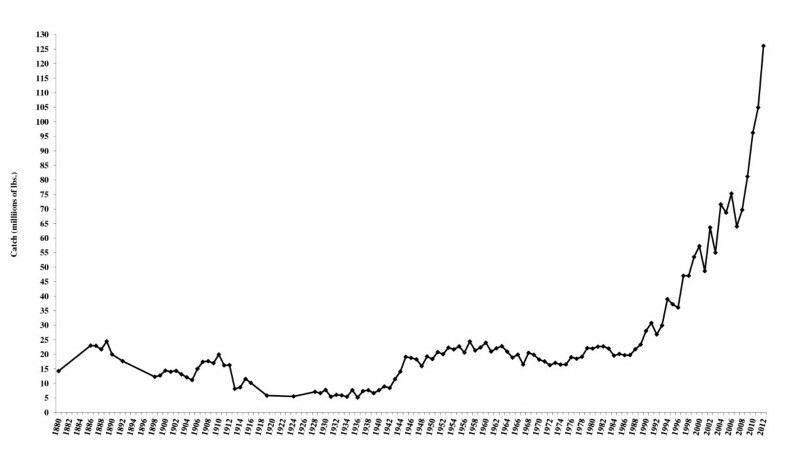 Catches of Cod, Haddock, and Yellowtail Flounder, Maine and New England, 1950–2012 (millions of pounds). Chart created by Ann Acheson; landings information generated from http://www.st.nmfs.noaa.gov/commercial-fisheries/commercial-landings/annual-landings/index. The biological consensus is that overexploitation by humans is the most important factor in the decline of the groundfishery. To be sure, water temperature, salinity, and predation by mammals have also played a role, but they are minor compared with overfishing (Sinclair and Murawski 1997). Since 1900, Maine lobster catches have varied greatly. During much of the 20th century, catch levels averaged between 15 and 22 million pounds. There are two exceptions. In the 1920s and 1930s, a period we call the “lobster bust”, catches declined greatly. Only 5.5 million pounds of lobster were landed in 1933 (Acheson 2003). From 1999 to the present, a period we call the “lobster boom”, catches have skyrocketed. Since 2000, more than 50 million pounds of lobster have been landed annually in Maine, almost ten times more than were caught in the early 1930s (see Figure 2). Maine Lobster Landings, 1880–2012. Chart created by Ann Acheson; figures from Historical Maine Lobster Landings. Augusta, Maine: Department of Marine Resources. http://www.maine.gov/dmr/commercialfishing/documents/lobster.tbl.pdf. The causes of the lobster bust and the boom are not known with certainty. Studies suggest that three factors are involved. One is August water temperature, which controls larval settlement success. Second, during the boom years there have been few large groundfish capable of eating small lobsters, whereas in the bust years there were many such fish. Third, is the growth of the conservation ethic, which has produced a decline in illegal activity and strong support for effective conservation legislation (Acheson 2003). The New England groundfishery is quite heterogeneous. Although all 15 groundfish species live near the ocean bottom, they have different life cycles, occur in different concentrations, and cannot all be harvested with the same type of gear. Currently dragging or otter trawling, which involves dragging a large net along the ocean floor, is the most commonly used technique, but many fish are also caught with gill nets. Some fishermen, especially in Chatham, Massachusetts, use hook-and-line technology. The sizes of the boats have also varied from 30 to 120 feet. Larger boats have left the fleet, however, and the largest boats currently used are 80 feet. Smaller boats (40–60 feet) have one- or two-person crews and take only one- or two-day trips. They generally fish within 60 miles of their home harbors. The largest vessels used to have crews of five to ten and stay at sea for a week or more. Although the crews of these vessels are part of a social network, people in the network do not all interact. Even though boats may fish on the same ground, it is often the case that crews do not know each other. In the groundfishery, people from a particular region do not know many fishermen from other regions (Holland et al. 2010) (see, Wilson et al. for additional information on ties between fishermen). That relative isolation is exacerbated by ethnic diversity (Italians in Gloucester, Massachusetts, Portuguese in New Bedford, Massachusetts, and so-called Yankee fishermen from Maine and New Hampshire). There are several different lobbying groups representing fishermen in different locations. In Rhode Island there are the Rhode Island Fisherman’s Alliance and the Rhode Island Commercial Fisherman’s Association, which often do not agree on policy. In Massachusetts there are the Cape Cod Fisherman’s Alliance in Chatham and the North East Seafood Alliance in Gloucester. Portland, Maine, is home to the Associated Fisheries of Maine, while the Maine Coast Fishermen’s Association represents groundfishermen in Port Clyde, South Bristol, and other towns in central coastal Maine. Though the groundfish management plan is the same for all of New England (discussed later), several rules apply to only certain areas or target species. Currently each species has its own catch quota. There are fisheries in which small-mesh nets are required (e.g., Acadian redfish). There are also habitat closures and rolling closures making fishing illegal in certain areas on a rotating basis. Throughout most of the history of the United States, fisheries were managed by the states, which typically applied few regulations to the groundfishery. There was no management of the offshore groundfishery in the northwest Atlantic until 1947 when the International Commission for the North Atlantic Fisheries (ICNAF) was formed. ICNAF involved 11 countries including the U.S., Canada, Great Britain, and the USSR, but it failed to conserve the stocks because regulations were not well enforced (Acheson 1984). In the 1960s, the Gulf of Maine was invaded by a large fleet of trawlers and factory ships that quickly overexploited stocks of herring (Playfair 2003). By 1972, the groundfish stocks in the Gulf of Maine were so depleted that the foreign fleets left (Acheson 1984). The U.S. government began to manage the groundfisheries with the passage by Congress of the Fisheries Conservation and Management Act (FCMA) of 1976, which gave the federal government authority to manage all fish species out to 200 miles (Maine Commercial Fisheries, 1973). Under the FCMA, the United States and its territories are divided into eight coastal zones. Each zone has a regional council composed of the heads of the state fisheries agencies, federal officials, and fishermen appointed by the governors of the states involved. The regional councils propose management plans for each species of fish to the Secretary of Commerce, who, with the advice of the NMFS, rejects or accepts the plans. Many plans have been tried in the New England goundfishery, involving virtually every kind of management tool from quotas and gear restrictions to seasons and days-at-sea. In addition, the U.S. Congress has updated the enabling legislation twice. Unfortunately nothing seems to have worked. Groundfish stocks are in worse shape today than when management began. In the following sections, we will cover only the most important groundfish management plans. Under the FCMA, the first management plan on the most important species of groundfish in the Gulf of Maine (cod, haddock, and yellowtail flounder) took effect in March 1978 (Dewar 1983). Under this plan, a catch quota was established for each species for a three-month period, and when the quota was reached, fishing was halted. The plan failed primarily because of industry lobbying and massive cheating by fishermen (Acheson 1984). Since the TMQ was not working, in 1979 the council decided to impose an interim plan, which involved mesh-size regulations, minimum fish sizes, and closed areas on spawning grounds (Barlow 1980; Morrison 1980). The interim plan was put into effect in 1982 and lasted until 1986. 1n 1985 the radically different Atlantic Demersal Finfish Fishery Management Plan (ADF) was proposed by the council after years of discussion with industry members. Since the ADF plan was put into place in 1986, it has been extended by 17 amendments (major changes) and 44 frameworks (minor changes). Many of the amendments put new restrictions on fishing in response to evidence of stock failure. Each amendment took years to develop and involved lengthy political battles. The most important amendments are described in Table 1. It should be stressed that unless otherwise noted, these plans applied to all groundfish species. Widespread recognition that Amendment 13 was not working. In the early years of the ADF, cuts in effort were quit moderate, but by the mid-1990s, the cuts ordered by various amendments were quite drastic. In 1994 the Stock Assessment Workshop reported that stocks had reached an all time low (Plante 1994). As a result, in 1996 the New England Council put in place the draconian Amendment 7 (Plante 1996a), with an objective of cutting “fishing effort for cod, haddock, and yellowtail flounder by eighty percent from 1993 levels” (Plante 1998b). By 1998, groundfish stocks, especially cod, had fallen still further (Plante 1998a). This resulted in a still more restrictive management plan, Amendment 9 (Commercial Fisheries News 1999). More severe cuts in effort came about with the advent of Amendment 13 (Plante 2002b). Along with the amendments described in Table 1, several other forces affected groundfish management. While the NMFS and the regional council were attempting to limit fishing effort, the actions of U.S. loan agencies and the International Court had the opposite effect (Acheson 1984; Apollonio and Dykstra 2008). Federal loan programs facilitated the entry of new vessels. In 1977, 1,200 licenses were issued; then in 1979, the number was increased to 2,191—an 83% increase (Acheson 1984). Changes in the international boundary also increased fishing pressure. In 1984, the International Court in The Hague drew a new international boundary between the U.S. and Canada in the Gulf of Maine that excluded American fishermen from waters they had used for centuries, including the Grand Banks, the Gulf of Saint Lawrence, Labrador, and even parts of the Gulf of Maine. American vessels crowded into the in-shore waters of the Gulf of Maine, where, by 1986, they considerably reduced the stocks of groundfish (Lannin 1988). In 1991 and again in 2002, the Conservation Law Foundation and other conservation groups (e.g., the Massachusetts Audubon Society) sued the Secretary of Commerce and the NMFS for “failing to prevent overfishing” (Plante 1991: 1A). The plaintiffs won both suits, and the court ordered the council to prepare a plan to prevent overfishing. One of these suits resulted in Amendment 5. The second resulted in Amendment 13, the development of which was strongly influenced by it being in the hands of a federal judge. 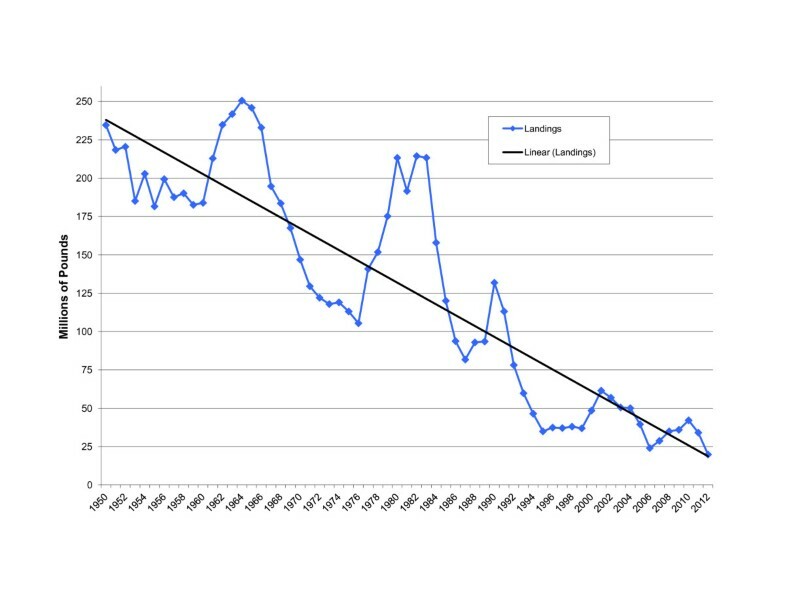 From 1984 to 1988, severe reductions in total catches were experienced as stocks became overfished (Figure 1). The catches of many species declined 30% to 50% between 1982 and 1988 (Lannin 1988). Stocks reached their lowest point in 1994, because “the spawning stock has collapsed” (Plante 1994: 11A). They have remained low ever since despite all attempts by the council and NMFS to revive them. As stricter regulations have gone into effect, fishing effort has also declined. Declining catches and more stringent restrictions have produced a precipitous decline in the number of boats. In Maine and New Hampshire, for example, the groundfish fleet declined from 343 in 1978 to 50 in 2009 (Acheson et al. 1980; Mack 2010). Four aspects of this history are especially important for our purposes. First, fishermen were unhappy with the management process. Every action of the council, the NMFS, or the Secretary of Commerce met with political agitation: heated hearings, visits from congressmen, letters to newspapers and public officials, and a long series of lawsuits by fishermen against officers of the NMFS or the Secretary of Commerce (Miller and Van Maanen 1979; Plante 1996b, 1999). These pressure tactics sometimes worked to reverse council and NMFS management decisions. Second, the groundfishing industry is divided into a number of factions that rarely attain consensus to promote or oppose any management measure. One group would work for management goals that would benefit it at the expense of other types of groundfishermen (Plante, 1998c, 1998d). Given the heterogeneity in the industry, agreement on rules could scarcely have been expected. In the recent past negotiations over Amendments 13 and 16 were especially nasty (see, Acheson and Gardner 2011). Third, there has always been a good deal of cheating. The TMQ plan (1978–1980) failed in great part because of massive problems with law enforcement, and widespread cheating continues today. King and Sutinen (2010: 7) estimate that “from 12 to 24% of the total harvest is taken illegally”. Fourth, management plans developed slowly. Extreme bureaucratic complexity (a “paperwork nightmare” according to Apollonio and Dykstra [2008: 73]), industry opposition and lawsuits along with jurisdictional conflict between the NMFS and the regional council all contributed to delay. After 1992, the council’s ability to set its own timetable was reduced by the two Conservation Law Foundation lawsuits and the reauthorizations of the FCMA, which gave greater power to the NMFS (Plante 2002a). One NMFS scientist said that delay permitted stocks to fall far more than they would have had stricter rules been imposed earlier. If that is true, delay was deadly. The lobster industry has always been an inshore trap fishery. Eighty percent of the lobsters are caught within three miles of shore. Since the 19th century, lobsters have been caught in traps baited with fish or fish remnants. Currently, there are approximately 6,500 lobster license holders. Lobsters are sold to dealers, who have buying stations in every harbor along the coast, or to one of 17 lobster cooperatives. The lobster industry is homogenous in terms of equipment and capture technology. By law, lobsters may be caught only in traps. These are hauled to the surface with a rope and marked with a buoy with colors registered with the state by a particular fisherman. Boats are generally between 30 and 40 feet long and powered with a gasoline or diesel engine. Boats are equipped with hydraulic trap haulers to bring traps to the surface, a flowing-sea-water tank to store caught lobsters, depth recorder, and radio. Lobster boats are operated either alone or with a single helper called a sternman. The lobster industry is highly territorial. Fishermen from each harbor have informal territories where they place their traps. According to Maine law, a lobster fisherman needs a state license to fish, but the fisherman also needs to be accepted as a member of a group fishing from a particular harbor, which I call a harbor gang (Acheson 1988, 2003). Once a fisherman is admitted to such a gang, he (or she) can only place traps in the traditional territory of that gang. Violation of these boundaries results in sanctions, either verbal warnings or two half hitches placed on the trap buoy. If the violation continues, traps may be surreptitiously destroyed. Fishermen from a particular harbor spend their lives fishing in a small area—perhaps under 100 square miles—with a small group who know each other well. If there is trouble, everyone has a good idea who is responsible, and people know who to go to for help. This makes it easy to monitor the behavior of others and reinforces enforcement of the conservation laws. From the 1870s when the first conservation laws were passed, lobster management has been based on size limits and a prohibition on taking lobsters with eggs. These laws protect juvenile lobsters and reproductive stock. There is also a law requiring the use of traps, a highly selective type of gear. Table 2 summarizes important Maine lobster conservation laws. Before the 1930s, the lobster industry was dominated by what we call the “pirate ethic”. Many fishermen, perhaps the majority, were involved in illegal activity. Millions of small lobsters were caught and sold and many were smashed and used for bait. Gravid females were also sold once the eggs had been cleaned off them (Acheson 1997, 2003). The fishermen who perpetrated these acts were convinced that violations did little damage to the stock. The conservation ethic in the Maine lobster fishery had its origin in the 1930s and involved a change in both behavior and attitudes. Our studies, particularly key-informant interviews of older fishermen, indicate that this change was due, in large part, to the lobster bust, which was a disaster for the industry. The lobster stock had crashed, and because of the Depression, prices were low. Between 1928 and 1932, 40% of the lobster fishermen went out of business; those who remained had very low incomes (Acheson 1997, 2003). The magnitude of the disaster convinced many that illegal activity was damaging and that there was a need for both new conservation laws and more stringent enforcement of the laws. Increasingly, fishermen and others no longer overlooked the illegal activities of “pirates”. They began to report illegal activity to the wardens, which made the warden force more efficient. By the end of the 1930s, enforcement had become so effective that the trade in “shorts” to Massachusetts had all but ceased. Piracy was no longer a profitable game; it had become a criminal activity, and one that most people considered shameful. In addition, the growth of the conservation ethic has increased industry support for conservation legislation. In 1933, a coalition that included fishermen, the commissioner of the Maine Department of Marine Resources, and powerful legislators was able to persuade the legislature to pass the “double-gauge” law. This law is a slot measure, specifying both a minimum-size measure to protect juveniles and a maximum-size measure to protect reproductive-sized lobsters. (Currently, to be legal, a lobster must be between 3¼ and 5 inches on the carapace from the eye socket to the end of the body shell). After World War II, support for the V-notch program grew dramatically. This law specifies that fishermen who catch an egged lobster may cut a notch in the tail before releasing her. The notched lobsters may not be harvested as long as the V-notch lasts. For decades thousands of fishermen have voluntarily cut notches in the tails of egged lobsters, resulting in millions of V-notched females—proven breeding stock—in the Gulf of Maine. Several conservation measures have been enacted more recently. In 1982, the Maine Lobstermen’s Association supported a bill to make it mandatory for all traps to be equipped with escape vents that allow small lobsters to escape. In 1995, the legislature passed the Lobster Zone Management law, which divides the coast into seven zones and allows the lobster license holders in each zone to impose three kinds of management rules on themselves. Proposed rules become departmental regulations enforced by the wardens only if two-thirds of the fishermen in a zone vote to approve the rule. By 1998, all seven zones had approved trap limits, which greatly reduced the number of traps each fisherman could fish; by 2004, six of the zones had passed limited-entry rules designed to reduce the number of fishermen over time (Acheson and Taylor 2001). All of these laws were passed by the legislature with the support of powerful industry factions, and there is little doubt that heavy industry support was necessary for their passage. Vinal Look, former commissioner of the Department of Marine Resources, pointed out, “No conservation law has ever been passed if the industry is against it”. Still it would be wrong to think that passage of these laws was easy. They were the result of distribution fights between industry factions seeking rules that would give them some kind of an advantage. Some of these legislative battles were lengthy and acrimonious (Acheson 2003). For decades, compliance with the law has been good. A person with a reputation for taking shorts and destroying the breeding stock will not only have trouble with the wardens but the neighbors as well. Groundfishermen and lobster fishermen differ when it comes to their attitudes about the management and future of their industries. In our 1978 survey, we asked 318 groundfishermen, selected at random, “What kinds of regulations would you approve for your section of the industry?” We received 72 different answers (see Acheson  for detailed results). The survey revealed four things about the attitudes of groundfishermen. First, many did not believe many (or even any) regulations were needed. Second, there was no consensus on what regulations should be devised. Third, there was no support for the types of regulations that the regional council and NMFS produced (e.g., a quota), but substantial support for rules that the NMFS staff believed were inadequate. Fourth, although many fishermen recognized that stocks were in difficulty, they doubted the ability of the government and political system to solve the problems faced by the industry. A follow-up study by the senior author in 2009 reinforced the idea that groundfishermen have a short-term perspective, and nothing in the institutional structure of the management regime gives them an incentive to invest in high-quality conservation rules. They focus on staying in business in the short run and hope stocks will not be unduly damaged by fishing (see Acheson and Gardner  for details). One summarized their attitudes by saying, “I know we have done a lot of damage to the stocks. But I need to keep fishing hard. I have bills to pay. I hope the fish stocks will last. If the fish give out, I will just have to find some other job”. Our 2009 survey of lobstermen, on the other hand, found that 75% or more of respondents rated all existing lobster laws as very effective. They were well disposed toward the zone management law, with almost 40% giving the system a positive rating, versus 26% negative. A sizeable majority of respondents said they favoured the current trap limits in their zones, and the vast majority favoured abolishing dragging for lobsters, which they regard as a wasteful practice. These attitudes constitute strong evidence of a conservation ethic. There are a number of technical, biological, and social and cultural factors that, according to rational choice theory, make the groundfish industry less likely to solve its collective-action problem than the lobster industry. The species biology and fishing technology present problems for groundfish management. Groundfishing gear is highly unselective, taking all sizes of fish, including juveniles and those with eggs. When groundfish are hauled to the surface from any depth, their swim bladders break and they die; a high percentage of all fish caught come aboard dead. Moreover, of the 15 groundfish species, several can be caught by the same technology, resulting in a serious by-catch problem. By contrast, lobster traps are highly selective. A lobster trap can be pulled to the surface, the undersized, oversized, and V-notched lobsters released overboard, and most these released lobsters will float to the bottom unharmed. The evolution of rules is connected with a large number of social and cultural factors that we model. Historically in the lobster industry, the pirate ethic gave way to the conservation ethic; no such ethic developed in the groundfishing industry. The adaptive behavior theory and evolutionary game theory give us tools to better understand what happened in these industries. We have developed a model to illuminate what happened in these two fisheries, building on the theory of adaptive management. Conservation lies at the heart of any successful management scheme. To present the starkest choice imaginable, consider just two conservation rules. Conservation rule I stands for the status quo. For the New England groundfishery, think of this as the traditional overexploitation of the fishery. Conservation rule II represents a better management scheme—of the sort that has been sought since the 1970s. It pays if every fisherman follows conservation rule II. If things were this simple, then fishermen would adopt conservation rule II and there would be no downward spiral. This is where the dilemma comes in. Let x(i) be fisherman i’s strategy, which takes on two values: x(i) = 1 if fisherman i follows conservation rule II, and x(i) = 0 if i follows conservation rule I. Finally, let X be the sum of the x(i). This notation suffices to track the strategies employed in the game. Let u(i) be fisherman i’s payoff function. The idea is that the full benefit b of following conservation rule II is only achieved if everyone in the fishery follows that rule. Otherwise, the benefit is proportional to the number following the rule. If everyone follows conservation rule I, then X = 0 and the payoff for each fisherman is 0. There are two cases to consider, depending on whether b/n > c or b/n < c.
When b/n > c, fisherman i has an incentive to follow conservation rule II even if no one else does. His payoff is (1/n)b – c > 0, which is better than conservation rule I pays. This inequality applies to every player, and the result is a Nash equilibrium x* of the game with x*(i) = 1 for every fisherman. The benefit to conservation rule II is so great that every fisherman adopts it. Unfortunately for the New England groundfishery, this is not the case that applies. Now suppose b/n < c. Fisherman i has no incentive to follow conservation rule II if no one else does, since (1/n)b – c < 0, which he would get from following conservation rule I. So there is a Nash equilibrium x* with x*(i) = 0 for all i. Plus, the same algebra applies to values of x greater than 0. So the Nash equilibrium we have identified is unique. This is the prisoner’s dilemma the fishermen face: x*(i) = 0 for all I is a strictly dominant strategy that leads to an inefficient outcome. It is hard to get out of a prisoner’s dilemma because the payoffs involved make it rational not to cooperate to produce high-quality conservation rules even though everyone would do better if such rules did exist (Axelrod 1984; Dixit and Skeath 2004; Gardner 2003). There are several ways to escape the prisoner’s dilemma. As we shall see, the lobster industry has been able to solve its dilemma by an unusual means—changing the culture of the industry (i.e., social preferences). Our model and the literature on evolutionary game theory (Gardner 2003; Hofbauer and Sigmund 2003; Samuelson 2002) suggest four factors led to the development of conservation rules: low discount rates, low transaction costs, the extent of cheating, and historical shocks. We consider these in turn. The first factor is the discount rate, which reflects people’s assessment of future gains. If individuals do not gain from the development of norms, they will not support efforts to generate them (Knight 1992). This means that if effective resource management rules are to be established, they must allow those who make the investment in the resource to benefit from that investment. Axelrod (1984) calls this the “shadow of the future”. If it is unlikely that resources will be there in the future or if investment in resources will not bring future benefits, there is little incentive to sacrifice current harvests for future rewards. Eric Alden Smith (2003: 421) neatly phrases the dynamics of this situation: “higher payoffs from cooperative production mean a greater incentive to solve collective-action problems, to ensure any needed coordination, and counter free riding”. Rational choice theorists have long recognized that a high discount rate lowers the willingness of people to get rules and invest in the preservation of a resource (Ostrom 1990). In the groundfishery, catches had been falling for decades; there was a lot of cheating; and fishermen were quite sure the government would not be able to revive the stocks due to (in their opinions) flawed science and inept management plans. In addition, the precarious economic position of fishermen made it imperative they get income now to pay off mounting debts. All of these factors lower benefits b and raise costs c. Under these conditions, groundfishermen had an incentive to take the stocks now—what we call a “goldrush mentality—indicating a high discount-rate strategy. Why sacrifice present gains when the fishery is in inexorable decline, and neither you nor your children will reap the benefit of any sacrifices made? The prisoner’s dilemma facing the industry has not been solved. In the lobster industry, the opposite set of conditions exists. Lobster fishermen are confident of good catches in the future. Most are convinced that the conservation rules are working and are congruent with the way the ocean works. The amount of illegal activity is low, and the laws are enforced. Under these conditions, it pays to support conservation rules. The second factor is transaction costs which also influence the value of benefits and costs of developing high-quality conservation rules. Transaction costs measure how hard it is to reach an agreement (North 1990). Rational choice theorists agree that characteristics of the community influence transaction costs. In particular, small, homogenous communities with a long history and sense of community are likely to exhibit low transaction costs. Members of such communities will be more likely to provide themselves with rules leading to joint benefits (Agrawal 2002; Elster 1989; Knight 1992; North 1990; Ostrom 1990, 2000a, 2000b; Taylor 1990). Under these circumstances, people know who is likely to cooperate, can monitor behavior, and can sanction shirkers. Moreover, since groups are homogenous, a proposed rule will affect everyone in the same way, thereby reducing conflict. The groundfish industry has almost none of the community characteristics that would lower transaction costs of negotiating and enforcing rules. Fishermen are scattered throughout New England and constitute a loose social network. Most do not know many other people in the industry, and they do not form a community with a long history. They are heterogeneous, both in terms of gear and of ethnicity. Transaction costs are high, most evident in the run-up to Amendments 13 and 16. The lobster industry has low transaction costs. The territorial system makes it possible for members of harbor gangs to monitor each other, resulting in effective enforcement of the rules. The industry is highly homogenous. Everyone uses traps, which are fished from similar-sized boats. There are no ethnic differences. Many lobster fishermen come from old established families that have lived in the community for many years and have intermarried. Everyone is known and has a reputation in such communities. A thick web of network ties reinforces solidarity. These factors have lowered the costs of getting high-quality rules in the lobster industry. Even here, however, negotiating conservation rules is costly: it takes time and generates acrimony (Acheson 2003). Transaction costs are also raised by the governance system put in place. Rational choice theorists have considerable evidence that effective resource-management rules are likely to arise if local-level communities have a hand in developing them (Ostrom 2000b). The rules to manage the groundfishery were developed in a top-down process in which the regional council was pushed in many different directions by the NMFS, judges, the U.S. Congress, scientists, and conservationists. Progress was stalled for years by bureaucratic complexity and jurisdictional disputes. Sometimes industry factions played only a small role, the antithesis of local participation. Fishermen trying to lobby for better rules have spent enormous amounts of time and effort with only frustration and anger to show for it. The industry’s response has been to oppose rules presented by the council or to try to stall their imposition, increasing transaction costs for all. The rules governing the lobster industry are the result of a more bottom-up approach in which the industry played a major role (see Acheson 1997 and 2003 for more information on the role of the lobster industry in producing these conservation laws). The third factor is the number of people adhering to a rule or violating it at any given time. Our game theory model indicates that if the population starts out with most fishermen having a pirate ethic, then evolution will lead to a population with all fishermen having that ethic—that is the evolutionary stable strategy. If the population starts out with most fishermen having a conservation ethic, then evolution will lead to a population with all fishermen having that ethic. The payoffs increase along the evolutionary path towards a good equilibrium. This prediction seems to be in accord with historical facts in the lobster industry. In the 1920s when the pirates were in the majority illegal activity was common. In the mid-1930s, more fishermen began to report violators and fishermen began to obey the law in increasing numbers. The number of fishermen joining the conservation effort swelled as enforcement became more effective and an increasing number of fishermen became convinced that violations of the law were causing serious harm to the stock. In short, the cost of defecting from the high-quality rule (conservation rule II) grew rapidly as the probability of being apprehended grew. Boyd and Richerson (2005: 247) note that “when punishers are common, defectors do badly, but when punishers are rare, defectors do well”. The switch from one strategy to another can happen quickly as the “evolution of cooperation is strongly affected by the presence of punishment” (Boyd and Richerson, 2005: 244). Unfortunately no cascade of groundfishermen support the rules proposed by the regional council. No conservation rule II rules have been developed that have received widespread industry support. The fourth factor is the historical events moving people from one equilibrium to another. Our model and the literature on evolutionary game theory suggest it takes a major event, a shock to the system, to change the system from one strategy to another. Key-informant interviews indicate the lobster bust was such a shock. This devastating event forced many fishermen to see the need for better conservation laws and increased enforcement. This finding is in accord with work by Libecap (2008) who says that rules to solve collective-action problems in resource management develop when the damage to resources is so great that people begin to understand what is happening and political support for conservation increases to the point where politicians can pass laws. No such conversion has occurred in the groundfishery despite the record low levels of fish stocks, the increasingly tightened regulations, and the large number of boats going out of business. All of the evidence suggests that most groundfishermen know that stocks have been overfished. Many of those remaining in the industry would like to do something to conserve stocks, but they are unwilling to invest much given the history of declining catches in the industry, with all that indicates about illegal activity, poor science and ineffective rules. Moreover, their financial situation is so desperate they cannot afford to sacrifice current catches for future gains. Despite what Libecap (2008) says, great damage to resources does not always lead to increased support for conservation rules. Some fisheries are easier to manage than others. Managing lobster is easier due to selective gear, biology and communities with the right traits to develop rules. But there still had to be effective rules. Although there is little consensus on the conditions under which such rules are generated (Taylor 1990), it is clear that earlier rational choice theorists saw rules as stemming from certain social events and various types of interactions, such as group size, heterogeneity, dependence on the resource, and boundaries (see Ostrom 2000a, 2000b). The small size and homogeneity of harbor gangs along with the territorial system certainly play a role in helping develop rules for the lobster industry. But more recent work calls attention to the importance of cultural phenomena in the process, and the relationship between rules and beliefs. In the framework of Axelrod (1986) and Ostrom (1990) change is driven by experimentation with new strategies or policies. New rules and strategies come about when people reject ineffective strategies and adopt those they believe will work. Ostrom (2010) stresses that some of the most effective experiments are those that begin small, and then are applied to larger problems when people are certain they are effective. It is only after people have learned which strategies are effective that a change in values, beliefs, and standard practices follows; this can take considerable time. Adoption of new beliefs and practices is usually highly differential, with some people adopting the new innovation before others (Ellickson 2001). In the lobster industry, the conservation ethic developed over time, with changes in beliefs and new rules reinforcing each other. In the early years of the 20th century, many lobster fishermen, perhaps the majority, had a piracy ethic. They took large numbers of short lobsters and scrubbed the eggs off egg-bearing females because there was poor enforcement and they assumed their activities had little effect on the resource. The lobster bust of the 1930s, however, forced large number of fishermen to change their attitudes about conservation, and only then could effective enforcement of existing laws and new legislation—the double-gauge law—be developed. Lobster fishermen did not immediately accept the value of this conservation rule; they needed to be convinced that it produced higher catches. Even when catches began to revive in the late 1930s, there were fishermen who did not believe the increase was due to conservation efforts (Acheson and Gardner 2010). It is unlikely that lobster fishermen would have pressed for more conservation legislation had catches stayed low, which would have made it impossible to claim that the double-gauge rule was working. But catches went up, convincing increasing numbers of fishermen they understood how the ocean worked and that additional conservation rules (e.g., the V-notch program and escape vents) were in their long-term best interest. In addition to new rules, there was also a change in the subculture of the industry, with altered beliefs about the damage caused by illegal activity, changed attitudes towards law breakers, and a willingness to enforce the law (Acheson 2003). The obverse of the same factors produced groundfish management failure. When management of the groundfishery began in 1977, the stocks, which were already low, were further devastated by the invasion of large boats after imposition of the Hague Line in 1984 and the build up of the fleet fostered by federal loan programs. The unselective fishing technology, along with the biology of the fish, led to high mortality on all fish caught. Many groundfishermen were convinced that the management rules were costly, unenforceable, ineffective, and based on a false scientific model of how the ocean works. They responded with opposition, lawsuits, and widespread cheating. This opposition, combined with bureaucratic complexity and jurisdictional disputes with the NMFS, caused the council to stall imposing rules until long after they could be effective (Apollonio and Dykstra 2008). Another block to new rules was industry heterogeneity, which made consensus virtually impossible. In the groundfishery cheating, ineffective regulations, factional politics, political opposition, and stock decline followed each other in an ever more desperate downward spiral. In the groundfishery, failure fed on failure; in the lobster industry, success fed upon success. Henrich and Henrich (2007: 66) state that norms come about as a result of “cultural learning and punishment”. This certainly applies to the development of the conservation ethic in the lobster industry. Fishermen first had to learn the damage that was being done by illegal activity and then punish those who were guilty. Experimentation with new strategies is critical to the success of adaptation. The Maine legislature has allowed a good deal of experimentation with lobster legislation. Some laws, such as the minimum-size measure, have been changed repeatedly in response to pressure from fishermen and biologists. The Lobster Zone Management Law has allowed fishermen to develop rules in different areas suited to local conditions. By contrast, groundfishing rules are produced by the regional council operating under federal laws and allow little flexibility or experimentation. In game theory, the technical term for the change in cultural values that occurred in the lobster industry is “social preferences”. These are cases where a player’s payoff no longer depends just on his or her economic result, but more broadly on the overall outcome. “The term ‘social preferences’ in game theory refers to the concern (or lack thereof) that people have for each other’s welfare. It encompasses a wide variety of behaviors, including altruism, reciprocity, an interest in equality and justice, and a willingness to punish those who deviate from norms or laws” (Acheson and Gardner 2011: 1015). In the literature there are a growing number of cases where people are far more cooperative than would be predicted based on games such as the prisoner’s dilemma (Camerer 2003; Nowak et al. 1995; Nowak and Sigmund 2005; Sigmund et al. 2002) and are willing to punish defectors (Fehr and Gachter 2000). Joseph Henrich and colleagues say that “researchers from across the social sciences have found consistent deviations from the predictions of the canonical model of self interest in hundreds of experiments from around the world” (Henrich et al. 2005: 795). They also show that culture plays an important role in determining game strategies leading to cooperation (Henrich 2000; Henrich and Henrich 2007). Groundfishermen may want to develop better conservation laws, but their power to do so is limited by the top-down management system. If the institutional framework is too restrictive, experimentation and learning do not take place. Without experiments that work, no rule will be embraced by the industry. Elinor Ostrom has pointed out that top-down policies “frustrate the development of private provision of public goods”, including rules and the subcultures that give rise to them (Ostrom 2000a: 38). Some people will argue that the new sector-management rules, which are part of Amendment 16, will allow groups of groundfishermen to experiment with different rules in different areas of the Gulf of Maine. Of course it is entirely possible, even likely, that the NMFS and regional council will side with those groups of fishermen who do not want area management. Under those conditions CR I-type rules will be produced and the gold rush mentality will continue. If this occurs, then actions of the government will have produced exactly what should be avoided—attitudes antithetical to conservation. This underscores the irony that some of the impetus for the downward spiral in the groundfishery has been produced by actions of government agencies trying to conserve the fish. Development of stewardship and a conservation ethic depends on the right kind of institutional framework. That framework has not existed in groundfish-governance structure. What can groundfish management learn from the lobster industry? The success of lobster management stems from the development of a conservation ethic in which fishermen have come to see that effective management rules and good enforcement are in their own best interests. After the radical transformation that occurred in the 1930s when the piracy ethic gave way, the conservation ethic has steadily expanded as the success of rules was demonstrated in ever-increasing catches. Several factors played a role in the success of lobster management. One is the selective gear used in lobstering. Another was rules to protect lobsters in vulnerable parts of their life cycle (i.e., the size rules and the v-notch practice) (Acheson and Wilson 1996). These factors augment the size of lobster stocks and catches in the future, lowering the discount rate and giving fishermen incentive to invest in new rules and enforcement activities. In addition, lobster fishermen live in small, homogenous towns with a long history, the type of community that most easily comes to consensus. Industry leaders have also had success in influencing legislation, helping ensure that the laws have good industry support, and can be changed if they prove inadequate. Given this background, the groundfishing industry might be well advised to abolish the unselective otter trawl; generate rules to protect egged females and the nursery ground of target species; manage the industry in small, local-level units; and allow fishermen to generate management rules and change them if they prove inadequate. Enforcement would also have to be strengthened. Such rules should be introduced slowly and effort should be made to ensure they are effective. None of these measures will prove viable unless the groundfish stocks improve. If catches do go up, then we might conceivably see a conservation ethic evolve in the groundfish industry over time. aGroundfish covered by the management plans discussed here are 15 species that live near the ocean bottom: Atlantic cod (Gadus morhua), haddock (Melanogrammus aeglefinus), pollock (Pollachius virens), yellowtail flounder (Limanda ferruginea), witch flounder (Glyptocephalus cynoglossus), winter flounder (Pseudopleuronectes americanus), windowpane flounder (Scophthalmus aquosus), American plaice (Hippoglossoides platessoides), Atlantic halibut (Hippoglossus hippoglossus), Acadian redfish (Sebastes fasciatus), ocean pout (Zoarces americanus), white hake (Urophycis tenuis), silver hake (whiting) (Merluccius bilinearis), red hake (Urophycis chuss), and offshore hake (Merluccius albidus). This article draws on research conducted over the last 40 years which was supported by a number of major grants: 1977–1980, National Science Foundation (James Acheson, PI), “University of Rhode Island-University of Maine Study of Social and Cultural Aspects of Fisheries Management under Extended Jurisdiction” (grant number AER 77–06018); 1997–2002, NOAA/SEA GRANT (James Acheson, PI) “Case Studies in Co-Management of Marine Fisheries;” 1998, contract with Maine Department of Marine Resources to conduct survey on Maine’s lobster management zones; 2008–2011, National Science Foundation (James Acheson, PI), “Evolution of Norms and Conservation Rules in Two Fisheries” (grant number BCS-0821968). The authors thank the hundreds of fishermen, members of the NEFMC, and state and federal agency personnel who kindly agreed to be interviewed. We also thank Michelle Martin, who gathered a lot of the archival data regarding the history of groundfish regulations and conducted phone interviews with groundfish license-holders; Barbara Harrity who did final copy-editing; and Ann Acheson who edited and commented on several drafts, administered several of the surveys, and prepared the figures. RG died in January 2010 before this article was completed. JA wrote all the drafts. RG's primary contribution is the model and the edits he did on the first draft. He was a wonderful research partner. JA read and approved the final manuscript.